The MVs have two Drum Majors each year. The drum majors are selected by the student leadership through an audition process that includes conducting a recording of a prepared piece, conducting a live band, calling marching commands, following marching commands, and a salute. Any current MV is welcome to audition for drum major, regardless of age or previous conducting experience, and current drum majors must re-audition for their position each year. The drum majors are both field commanders and field conductors, and it is their responsibility to maintain discipline and order on the field. They must have a thorough understanding of the music and drill for each show and be able to assist those who need help. In the past, the MVs had a single Feature Twirler, but in recent years, we have featured as many as three. Feature Twirlers are selected by the directors from audition videos which are sent in early in the summer. The twirler(s) must excel in creative and interpretive performance, and work independently to design their routine for each show. Even current twirlers must re-audition for their positions each year. Marching 36 strong with some of the highest piercing notes in the Marching Virginians is the VT Pix section. The Marching Virginians march all piccolos. While you may audition on flute, everyone plays piccolo on the field. The VT Pix are a fun section that loves to dance at football games as they cheer on their fellow Hokies! The MV 'Nets may not always be visible on the field, but it's impossible to miss them in the stands. 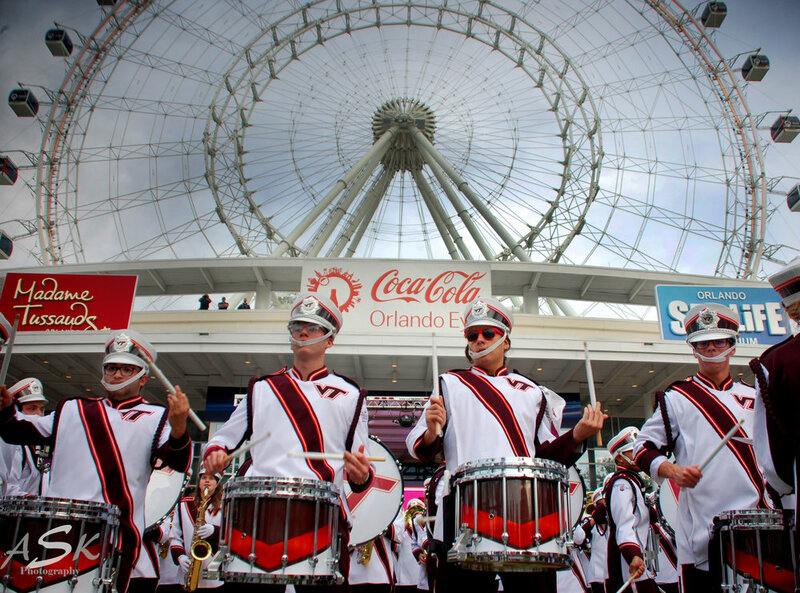 Their 36 members are always playing, dancing, and cheering the Hokies to victory! Loud, proud, and fearless (leave them alone for too long and they'll end up napping), the 'nets have some of the coolest people you'll get to know throughout your college career of 4, 5,...or 10 years at Virginia Tech! The MV Saxes are a close-knit family within the Marching Virginians. Made up of a mix of alto and tenor saxophones for a total of 36 members, the sax section is known for being laid-back and quoting Sharknado fortuitously. Like sports? Sigma Alpha Chi (ΣΑΧ) usually fields their own intramural flag football, basketball, and softball teams throughout the year! From the opening call in Tech Triumph to the zesty sounds in Caravan, the MV Trumpets are the section that gives the Marching Virginians its melody! Trumpets spend most of their time near the front of the field during halftime shows and parades. They love performing for the best and most enthusiastic fans in the country. Each year the section is composed of 63 amazing individuals with great attitudes and tremendous work ethics who help put on amazing shows with a breathtaking sound. The MV Horns are by far the most easy-going and fun-loving section of the band. At roughly 28 members, they are one of the smaller, and therefore tighter, sections within the MVs. While they're usually pretty laid-back, this section gets really lively for football games. When they aren't too busy yelling and cheering, they are dancing to the drum cadences in the stands. With traditions like camping, dinner, and a Christmas/end of fall semester celebration at Homeplace, the horns maintain strong bonds while sharing the joys of Hokie football. The MV Bones are the favorite section of Frank Beamer, former coach of the Virginia Tech Hokie football team. With thirty-six members, the MV Bones provide the heart of the "middle voices" that color the Marching Virginians' distinctive sound. Large-bore trombones are provided by the school, so you won't find any "peashooters" or F-triggers here. 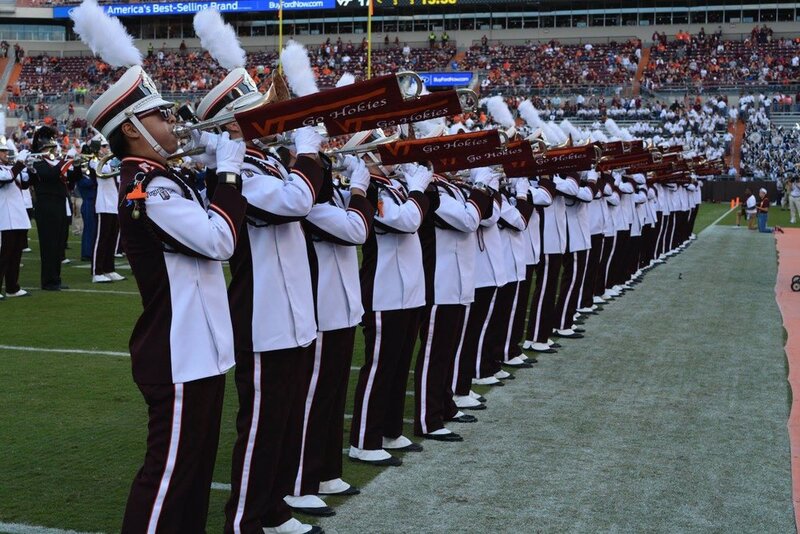 Throughout the year, the Bones cheer on the Hokies and celebrate Hokie football in exciting ways that only bones can. As Steve Wulf put it in his article in ESPN The Magazine, the MV Tones are "the free spirits of the band" - they do their own thing. You won't see the Tones performing at the front sideline with the rest of the band. No, their spot is on the back sideline. The tones are the smallest section in the band at around 14 members, and therefore, one of the closest sections. Forward-facing marching baritones are provided by the school for the marching season (yes, the original uprights are finally retired!). The Tones are also known throughout the band as the best dancers. Because of their "class clown" type antics and leading role in the Hokie Pokie, the VTubas have earned a bit of a reputation for goofing off and stealing the spotlight. However, if you dig a little deeper, you will find that this close-knit group of around 20 members is actually one of the hardest-working and reliable sections in the band*. If you think carrying a sousaphone while dancing in front of 65,000+ cheering fans could be fun, this just might be the section for you! *They ask that you please keep this information to yourself, since they wouldn't want to ruin their hard-earned reputation! The MV Flags truly love to perform and give visual life to the music the band plays. Throughout the season they work hard and have fun learning and perfecting intricate routines for every show and event, and they're very passionate about the traditions they carry on through their signature routines for Tech Triumph, the Hokie Pokie, and the Pregame Show. When they're not on the field, the flags also like to work together to make a difference through community service projects. During the 2010-2011 season, they collected over 200 prom dresses and accessories for local high school girls who could not afford them through the Cinderella Project. This thirty-six member group is fun and outgoing, if not sometimes a little crazy! They strive to share Hokie Spirit with everyone through performance, friendship, and service. The MV Managers, or the behind-the-scenes team, are the logistics and support team for the Marching Virginians. A team of 14 students that looks to support all the needs of band as they take the field. The managers look to help the 330 member band function like a well-oiled machine from practice to performance.